The Summer 2018 issue of the Municipal Leader features a Special Report on Cannabis Legalization, as municipalities are navigating the evolving landscape of cannabis-related issues and their effect on local communities. 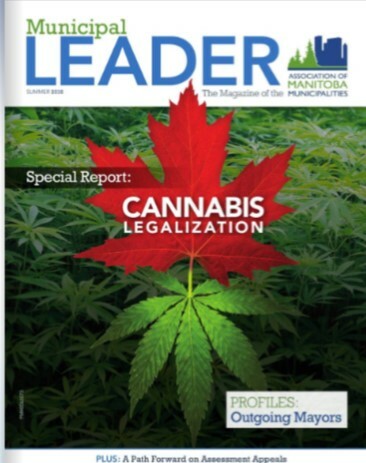 The Special Report also includes a jurisdictional scan of how provinces are preparing for the legalization of cannabis and an overview of anticipated municipal costs as well as articles provided by the Province of Manitoba regarding its retail distribution strategy and municipal zoning guide tailored to Manitoba municipalities. With the 2018 municipal election just around the corner, the Summer 2018 issue also profiles various outgoing mayors, including the Mayor of Steinbach and AMM President Chris Goertzen, from around Manitoba that have decided to not seek re-election this fall. Their service and contributions offer several insights into municipal governance and helpful tips for perspective candidates.